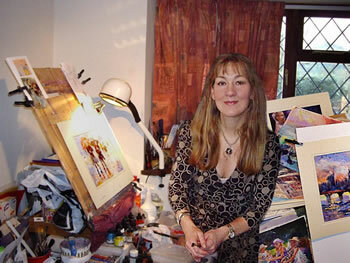 (member of Fine Art Trade Guild) in Surrey UK. very close to original paintings in appearance. Great News: A large selection of Sera's Art is now available as Greeting Cards, Posters and Prints in a Range of Size and Frame Options. Sera M. Knight has been drawing and painting since childhood. She paints mainly in watercolour, acrylic and mixed media. Tackling human figure and perspective has always been her favourite subjects but she enjoys the challenge of all subjects. Regardless of the subject, to be able to use the light cleverly, create a mystical atmosphere together with technical and emotional strength is her aim. Sera also paints on glass objects to the effect of stained glass and exhibits these separately. Born in Ankara, Turkey, Sera has a degree in Architecture. She lived in Stavanger, Norway from 1980 to 1993 and worked as an architect in the oil industry. Now living in the Woking area of Surrey, Sera is a member of various art societies and groups and exhibits her work regularly within these. She also teaches adult education classes and tutors private groups in mainly watercolour, mixed media and drawing mediums. This includes galleries of original paintings of Ballet & Dance, Music, Boats, Street Scenes, Horses & Ascot Races. Comment from lady in Australia who purchased one of Sera's Ballet & Dance calendars. "I think all the paintings are beautiful - I'm an artist and when I saw Sera's work my heart just leapt- the images are like what I picture in my mind but can never get across. They capture the passion of dance and movements- her work is amazing. I brought a calender for my friend's daughter- she is 10 and a ballerina. For a while she was dancing at the Victorian School of Ballet and even recieved good reviews for her small role in Nutcracker but had to withdrawal due to financial struggles. I am hoping the calendar will keep her inspired until another opportunity comes around for her." - Andrea Do Santos, North Victoria, Australia. 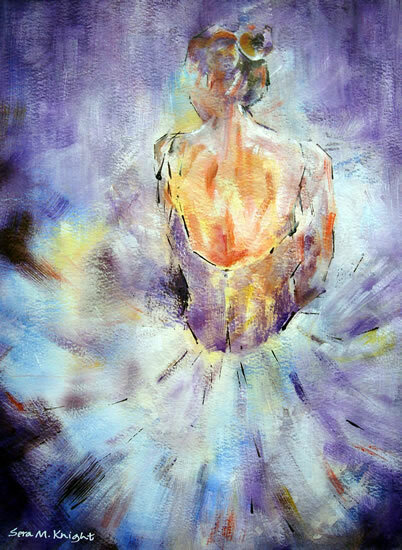 Following the popularity of the 2009 calendar of ballet & dance paintings and Christmas Cards, we plan to issue a selection of paintings as greetings cards, which will include a ballet and dance collection. These are high quality but affordable cards and will be blank inside, so they are suitable for birthdays, party invitations, notelets and for many other purposes.